Activities for students with above-average skills (and for all)! Presentation This is an Erasmus + project, STEM For All Seasons (2016-2019), under which various activities were carried out. Why... activities for students with aboveaverage skills (and for all)?! However, it is also a fact that each student has his/her own particularities and needs. The starting point was/is the meteorology ... so it's called: STEM For All Seasons! which was the starting point for all activities built, both as an instrument of work and as a theme of work (time). WHO ARE THE STUDENTS WHO BUILT THE LESSON PLANS AND WHO ARE THEIR ADVISORS? Collaborations and acknowledgment: A special, deep and heartfelt, thank you to the Fundação Lapa do Lobo (http://fundacaolapadolobo.pt/fll/) for the fact that it has been supporting and financing the Investing in Capacity Project since 2012/13 (https: // www. 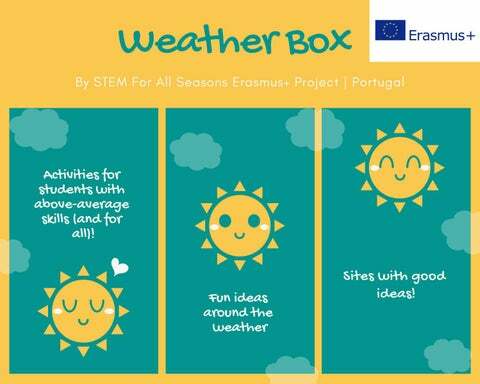 edufor.pt/aenelas-pic/), in which the 7 students who developed the projects referred to in this Weather Box grew in several areas (Science, Communication and Creativity). The Investing in Capacity Project has counted on several Structural Partnerships - Nelas Group of Schools, Fundação Lapa do Lobo, Nelas City Council, Catholic University of Viseu, Viseu Polytechnic Institute, Portuguese Association of Sports and Youth of Viseu, EduFor Training Center - and also with annual collaborations - to which we are deeply grateful. Students who entered into the Individual Projects Phase of the Investing in Capacity Project 2016/17 have developed their Projects under this Erasmus + Project STEM For All Seasons, for 30 months. We thank the Edufor Training Center for the invitation to integrate this Erasmus Project and the support throughout the Project. We thank Professor Ana Isabel Loureiro for reviewing the article published in English under this project. We thank all the teachers of our Group of Schools (Nelas) that opened the doors of their classes for the teaching of the classes by our students and for the presentation of their projects. We thank all the institutions that have cooperated in the research and other learning moments under this Projetct. 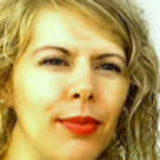 We thank Professors Carla Lopes and Bruno Cardina for information on programs that could be used to e-book building. To Professor Bruno Cardina, we also thank the recordings of classes and the transnational meeting in Portugal. We thank the valuable collaboration of Professor Bruno Alves (external element to the school) in the assembly of the pdf of this book and its digital version (e-book). We thank the Operating Assistants D. Cristina Gomes and D. Sabina Amaral for the logistical support provided at the transnational meeting and in some classes given. We thank the Group Administrative Services for their support. We are grateful to all partners across the borders of the STEM For All Seasons Project - Ireland, Germany, Greece and Slovenia - who have thought and organized with us this Project, with special emphasis on the excellent Coordination of Ireland. It was an extraordinary adventure with 5 voices, always in tune, of various learning. We thank the Director and Deputy of the Nelas Group of Schools for unconditional support throughout the Project. We thank all STEM for All Sesons students who, with great dedication and commitment, have made this Project possible, and the trust and presence of their parents. We are grateful to all the teachers of the STEM For All Seasons Project for their/our full dedication and presence at all times. Each stage was successfully overcome thanks to the arms that joined in the search for the various solutions. GOALS 1- Recognize that there is a science that studies phenomena related to meteorology. 2- Describe the atmospheric conditions of the day, recognizing the most appropriate designation (rainy, hot, cold, windy ...). GOALS 3- Relate the seasons to the characteristic weather conditions. 4- Recognize the existence of air. 5- Relate the wind to the movement of the air (currents of air, their orientation and their effects). CONTEXTUALIZATION · The time it takes (to record daily weather conditions). · Recognize some weather conditions (rainy, hot, cold, windy ...). · Relate the seasons to the characteristic weather conditions. · Recognize the existence of air (perform experiments). · Recognize moving air (wind, air currents ...). METHODOLOGY o Talk with the students about the wind and its orientation. o Provide the activity-oriented report to be developed. o Provide a card with the compass card. o Build a weather vane. o Observe the effect of wind. o Record the observed data. o Analyze the data. METHODOLOGY o Activity performed by the teacher with the collaboration of the students. o Discuss with students about the wind and its effects. o Provide the activity-oriented report to be developed. o Observe the effect of wind. o Record the observed data. o Analyze the data. EVALUATION oÂ Â The students receive a card that accompanies the activity, which, in addition to giving instructions on the activities that are being carried out, allows to evaluate the degree of comprehension of the contents worked. Man has always had the ability to inhabit all continents. The plants too! Oaks, holm oaks, cork oaks, pines, are portuguese native species. CONTEXTUALIZATION Our species are being harmed by the species that Man transports, either for ornamental purposes or for soil fixation. In nutrientpoor soils, the presence of nitrogen and its fixation will cause changes in the community of living beings, transforming ecosystems. We have no idea how these species will adapt to our ecosystems. CONTEXTUALIZATION For example the mimosa, Acacia dealbata, first exotic and brought to Portugal in the 1930s of the twentieth century to hold the dunes and prevent the sands from invading agricultural land, quickly became an invader. CONTEXTUALIZATION A naturalized species with a high reproduction rate that is able to colonize areas far from the initial zone of introduction, it has adapted incredibly well to our ecosystems, modifying them and threatening them as well as biodiversity. It is considered one of the worst invasive species in terrestrial ecosystems in continental Portugal forming very dense stands that prevent the development of native vegetation. CONTEXTUALIZATION Invasive species are currently one of the main factors of biodiversity loss on the planet, and Portugal is no exception. According to Cristina Mรกguas (professor of the Department of Plant Biology of the University of Lisbon), the issue of invasive plants is a global problem whose resolution has to happen locally. She adds that in places where we find acacias, they do not let grow anything else - not even the eucalyptus! 1. Relate temperature and humidity (watering) with the germination time of each seed and with the place where the pot was placed. 2. Match point one with the data collected at the Station. 3. Construction of a data analysis grid. EVALUATION A form is given to the students, which serves to give instructions on the activities that are being carried out, allowing to evaluate the degree of comprehension of the contents worked. 6- Understand the influence of temperature and precipitation on the quality of wine. Ambient temperature is the air temperature of a given location. Precipitation is all water in the liquid or solid state in the form of snow and this results due to condensation of the water vapor that is located in the atmosphere. CONTEXTUALIZATION A thermopluviometric graph represents the temperature and precipitation recorded at a site during the period of one year. The thermopluviometric graphs have different values according to the climate. The red line refers to the temperature variation. The blue bars correspond to the precipitation. CONTEXTUALIZATION In our region, in general, the colder months also correspond to the months when the biggest rains occur and the hottest months, to the driest months. The climatic conditions verified in one place make a lot of agriculture, so there are more or less defined the best times for the accomplishment of certain agricultural tasks. For example, pruning (cutting of sticks) and empa (tying sticks to wires) of vines occur in winter. CONTEXTUALIZATION The quality of a wine is influenced by several factors, such as: • The way grapes are grown and harvested; • Oenological practices carried out (wine treatment); • The amount of rain; • Temperature variations; • The type of soil; • The geographical relief and altitude. All of these factors influence the quality of the wine, as they make the wines have different colors, aromas and flavors. The climatic conditions of a place influence the ripening of the grapes, as well as of all the fruits in general. As the grapes ripen, they reduce their level of acidity and increase the sugar level. CONTEXTUALIZATION In addition to sunlight and heat, grape production and the quality of wine produced are also influenced by the volume and distribution of rainfall throughout the year. Intense rains during the harvest period can impair the quality of the grapes, reducing sugar levels and increasing the risk of fungi and diseases. CONTEXTUALIZATION The heat during the day is beneficial for the grape to ripen properly, while the cool of the evening allows the vine to rest, maintaining greater acidity and freshness of the grapes. This makes the producers in the warmer regions look for terrain of altitude - where the nights are cooler -, achieving an ideal balance between daytime and nighttime temperatures. Question students about the concept of Temperature and Precipitation. Define thermopluviometric graph. Distribute a worksheet to accompany the presentation with the answer to certain questions. METHODOLOGY Construct the thermopluviometric graph using the excel file and the student collaboration that will dictate the precipitation and temperature values for the Nelas region using the data found in the spreadsheet table. Answer questions 2, 3 and 4 of the card. After collecting the weather station data for the year 2017, they will be entered by the students into an excel table and the graph will be constructed simultaneously. The data on the chart are analyzed by the students, who also fill out a worksheet. 1. Identify the regions of Portugal. 2. Locate the wine-growing regions of Portugal. 3. Characterize the predominant climate in different regions. After a brief review of the literature on the subject, a theoretical work was carried out, which describes the climate in Portugal and the regions that constitute it, about which the student spoke in his class. According to the country's division into wine regions, the predominant varieties of grapes, the sensorial characteristics of the wines produced by them and the phenology in each region were identified, information shared in the classes given. After a brief exploration of some of the climate information and their influence on the grape varieties and consequent influence on the wines, students are invited to participate in a small game, by teams, with questions-answers, about the knowledge they have acquired previously. Lastly, they will have to individually resolve a worksheet and evaluate the lesson. The student-teacher found it pertinent to speak about this subject for children, in a necessarily simplified and playful way, with the aim of instilling in them fundamental care for the forest and fire prevention. There are houses that represent advances in the game and others, retreat; Whoever gets to the last house (Gloria) wins first. GOALS 1. Learn that the atmosphere is divided into layers. 2. Know some of the characteristics of the layers of the atmosphere. GOALS 3. Realize the size of the atmosphere and the planet Earth, in reality. 4. Know what can be found in each layer of the atmosphere. 5. Know the altitude and temperature of the various layers. How does temperature change to the earth's surface; How the temperature in the atmosphere varies. Model, already built by the student-teacher. The student-teacher presents himself, contextualizing this class and what he intends to teach (talk about the terrestrial atmosphere). 2. The student-teacher explains what is represented in his model and the scales of the globe and the atmosphere. 3. The student-teacher explains the characteristics of each layer of the atmosphere, including altitudes and temperatures. 4. Students interact with the student-teacher throughout the class. 5. Students will fill out a small questionnaire that will collect the qualitative and quantitative evaluation of the degree of satisfaction with this experience. ACTIVITY BUILDING "At the beginning, I idealized what I wanted to do. The initial ideas held, but with a few small details added. The simulation involved a lot of work to be done, either on my part or from others, at home. In the end, everything was worth it and I liked the final result. " The data collection was done through the fact sheets that the student-teacher did for the students to complete during the lesson. DATA COLLECTION Most students demonstrated that they actually learned in that class; in fact, the answers were correct in the two classes where this class was taught. ANALYSIS OF RESULTS | EVALUATION The student-teacher gave the students cards to complete at the end of the class, where they rated the class on a scale of 1 to 5 and wrote a little about what they found. The result was very positive because the majority gave 5 and found the subject interesting. GOALS 1- Produce electricity by friction between objects. 2- Produce electricity using a wind generator. 3- Perform simple experiments with lamps, wires and other conductive and non-conductive materials, using the wind generator. 4- Build simple electrical circuits. CONTEXTUALIZATION The activity consists in using data on wind direction and wind speed, collected at the meteorological station, as a starting point for the possibility of using wind energy in the production of electricity. CONTEXTUALIZATION This activity was implemented by the students of the STEM For All Seasons, in a class of the 4th grade (1st Cycle), using a methodology of laboratory work; simple circuits (lamp, switch, wiring and wind generator) were built to test the influence of wind speed on the production of electricity. Part I: The activity was developed in a 4th grade class by the students of the Erasmus + STEM For All Seasons Project (Portugal) - the student teachers -, in the form of laboratory activity: the students of the 4th year proceed to the assembly of a simple electric circuit. METHODOLOGY Students in the 4th year assemble a simple electric circuit (lamp, switch, wiring and wind generator) and test the influence of wind speed (measured on anemometer) in the production of electricity. Part II: data collection Later, the data obtained by the meteorological station are analyzed, and the best days for the production of electric energy are selected. The convection currents are currents generated by the movement of the magma in the Astenosphere. The magma is at high temperatures, in the pasty state, and under great pressure. The difference in temperature between the Earth's surface and its nucleus moves the magma, giving rise to the convection currents. HOW DOES THE WIND FORM? The wind is formed in the same way as the convection currents, except that, unlike these, which are formed in liquid or magma, the wind forms in the air. The wind is formed by the collision of two masses of atmospheric air of different pressures and temperatures. Air travels from low pressure (hot air) to high pressure (cold air). red and blue dyes x-act colored plastic paper two clips. 1. Start by filling the aquarium with water at room temperature up to Âž. 2. Cut small holes in the boxes and place them semi-submerged, fixed with staples on opposite sides of the aquarium. 3. Blush hot water with red. 4. Freeze water with blue dye in small cubes (freeze beforehand). 5. Insert the plastic paper into the center of the aquarium. 6. Place the colored ice in one of the containers. 7. Pour red hot water into the other container. 8. Observe the results. 1. Explain to 4th year students, in a simple but thorough way, how a wind turbine works and, consecutively, how to generate electricity from the wind. Why was it helpful to construct the anemometer within the given classes? The constructed anemometer was useful to demonstrate to the target audience (4th grade students), to whom we taught Lesson Plans, how the intensity and speed of the wind influence the production of electric energy from the wind force . Dremel; Cylindrical metal section; 4 plastic round bowls; 12 threaded nuts; 4 screws. Drill 4 holes in the cap at the same height in the shape of a cross, whose intersection forms four angles of 90 Â°. Stick the four bowls. Insert the bolts through the holes made. ROTOR CONSTRUCTION STEPS TO FOLLOW Insert one nut per bolt followed by a bowl. Insert two other nuts so as to lock the cups, preferably at a 90 Â° angle with the concavity horizontal with respect to the angle. Confirm the installation, and the cups should not come out of the screws. VEIN CONSTRUCTION STEPS TO FOLLOW Using the Dremel, drill the center of the metal section to fit the bearings. Insert the bearings into the threaded rod, one being over the other. Insert the threaded rod, and hence the bearings, into the section hole, allowing the bearings to rotate freely. VEIN CONSTRUCTION STEPS TO FOLLOW Tighten the bearings against the metal section with the self-locking nuts, allowing the bearings to roll freely above and below the cross-section. The bearings must be tightened. Confirm that the rotor has no rolling resistance and will not leave the shaft. PEGA CONSTRUCTION MATERIALS REQUIRED Attach the top of the tube to the coil spring. Attach the bottom of the tube to the screw holder. Using a self-locking nut, attach the finished handle to the shaft by the bottom of the bracket. Confirm that the rotor rotates freely after installation. INSTALLATION OF THE TACHOMETER AND CALIBRATION | STEPS Using zip-ties, hold the central module to the handle. Install the sensor into an extension of the handle, created using an L-shaped metal part, which extends to the center of the cups. Install a magnet in one of the cups so that it passes over the sensor, and to balance the others, install counterweights with a similar mass. Follow the instructions in the manual to set the tachometer. Check values with those indicated on the weather station and calibrate if necessary. Take into account that the value can not have an error greater than 3 km / h.
Know what STEM stands for Know the type of information given by a weather station, such as the one in our school, acquired under the STEM For All Seasons Project. Identify technological objects, used in the present. Recognize the importance of technological evolution for the evolution of society, relating objects, equipment and technological solutions with different needs and problems of everyday life. METHODOLOGY Students meet in groups; The teachers distribute the worksheet, which will be filled with the use of a careful analysis of the information contained in the Meteorological Station, in a group; Students complete the final questionnaire. If you can not afford a weather station, you can do one! PROGRAM The construction of this station was inspired by the training held in Ireland (within the scope of this project) where a small robot was built based on the arduino one.